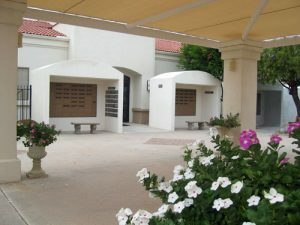 Memorial Services are held at Sun Lakes United Methodist Church in the Sanctuary, seating up to 600 people, or in the smaller Chapel which seats up to 80 people. A memorial wall plaque for those wishing to be buried elsewhere. We will assist in final disposition through arrangements with any licensed funeral director. All of these services are available to members and friends of Sun Lakes United Methodist Church or the greater Sun Lakes area. For additional information please call the Church Office at 480-895-8766.